The increasing concerns for sustainable economy and alarming environmental health are making researchers to pay serious attention to bio-fuels that too primarily synthesized from the biomass. An energy transforming machine extracting energy directly from biomass would be an idyllic condition. Regrettably, devices using sustainable energy resource have shown to have low output, not meeting the demands of practical appliances. Serious efforts are being dedicated to research on the prospects of bio-fuel powered fuel cells as green energy exchange tool. To comprehend this, scientists are working on the production and expansion biological fuel cell (BFC) which are electro-chemical devices utilizing electro-active bacteria for producing electricity through oxidation. The materials used for electrodes in BFCs, should have conductivity, porosity, biocompatibility, low in cost and recyclability. The materials tested for BFCs are principally metal-based, carbon-based or purposely built advanced materials. The research efforts over the last decade have positioned macro-porous and composite of carbon-based nanostructures with controllable surface and electronic characteristics to be used as a support-matrix for metallic electro catalysts or as proficient non-metallic electro catalysts in BFCs. This review article discusses about the present challenges and future prospects in the field of current progresses in the field of carbon based catalysis system for biomass based microbial fuel cells which extract energy from biomass resources either directly or indirectly. A fuel cell is an electro-chemical machine that generates electricity by a chemical reaction making a hydrogen fuel react with some oxidizing agent. Fuel cells are mainly classified by the characteristics affecting their performance like the type of catalysts, electrolyte used, the fuel required and temperature-range [1, 2]. Each of them has their specific boundaries, advantages and prospective relevance. Fuel cells are classified into following catagories. Among all the type of fuel cells, the biological fuel cells or bio fuel cells are the ones converting bio-chemical energy into electrical energy. In bio fuel cells the substrate is carbohydrate (as biomass) and the catalyst is an enzyme or a microorganism. Bio-mass is prepared from the organic wastes of animals and plants. Since ages, this biomass is being used as the principal source of energy by people. Out of all particularly it is the wood which was being used as basic resource of energy until the inception of the industrial revolt in 18th century when, the use of new energy sources based on fossil fuels, like steam engine, coal, petroleum, and the internal-combustion engine dominated the energy supply. As compared to the limited reservoirs and non-renewable nature of fossil fuels the predominantly accessed biomass source the woods, re-grow in each 50–100 years. Therefore it is the call of the hour to reducing search practice for the options to fossil fuels. One such existing solution uses crops and agriculture remains as a source of energy production [3, 4, 5, 6, 7]. The organic remains of plants are being used in a number of ways, (i) by burning them to generate heat and steam, (ii) by thermal decomposition of biomass under specifically controlled environment, (iii) fermentation and distillation of carbohydrates to produce a liquid fuel, ethanol. A recent method involves anaerobic microbial decomposition of biomass to produce gases like methane and carbon di oxide. A novel carbon based nano-composite was developed using E.coli as a microbial catalyst , nano Ni dispersed carbon-nano-fibers (CNFs) were developed on activated carbon substrate [9, 10, 11]. These can be purified by an up-graded method to more sought-after forms, appropriate for fuel-cells, engines, boilers, industrial-heaters and gas-turbines, etc. even though at some energy loss is also being observed [12, 13, 14, 15]. Production of combustible fuel by using biomass certainly involves rigorous energy consuming practices, as pulverizing, drying and residue elimination. All these processes result in loss of energy which increases the cost of production too. Therefore, researchers are searching for methods with efficient energy conversion with low expenditure. The conventional processes of energy production by using biomass, involves three major processes [16, 17] (Table 1 and Fig. 1). To perk up the overall efficiency of this process of energy generation is structured into three specific measures: (1) improvement in plants (2) improvement in the processing routes and (3) improving the catalysts, focusing all the three steps, respectively [18, 19, 20, 21, 22, 23, 24, 25, 26]. A fuel-rich and an effortless resource, such as cellulose can directly be used for this purpose , but even after the mammoth efforts by researchers internationally, this objective still looks distant from authentic practical executions. Therefore, scientists intend to enhance the energy–density and plant degradability by analyzing and restructuring metabolic and genetic alterations [18, 19]. A different way out is the improvement of breaking and fermenting of biomass into minor constituent mono-saccharide molecules such as glucose, and finally to bio-ethanol and bio-hydrogen. This direction of study is making scientists shift their attention towards production of highly proficient inexpensive enzymes and genetic modification of microorganisms. After the production of biofuels, the main task for researchers is the energy conversion and utilization of the chemical energy by using the principles of nanotechnology. In current scenario nanotechnology has garnered a great deal of commercial, environmental and engineering applications. With the help of nanoscale metal electro-catalysts providing large catalytic surface area, the durability, efficiency and cost of the process of biofuel generation can be improved [28, 29]. A range of nanomaterials derived from noble metals, metal oxides and carbon composites can potentially function as an excellent substitute to the enzyme-catalysts to advance the performance of biofuel cells. Carbon derivatives when used with metal nanoparticles are being reported to modify the catalytic activity of metal electrocatalysts [30, 31, 32]. Carbon nanotubes containing iron nanocatalyst shows a high stability and remarkable reactivity when used in polymer membrane fuel cells . Graphene when used with a coating of cobalt nanoparticles is found to be more durable and shows positive catalysis for the reduction of oxygen in fuel cells in the league of noble metals like platinum [34, 35, 36]. 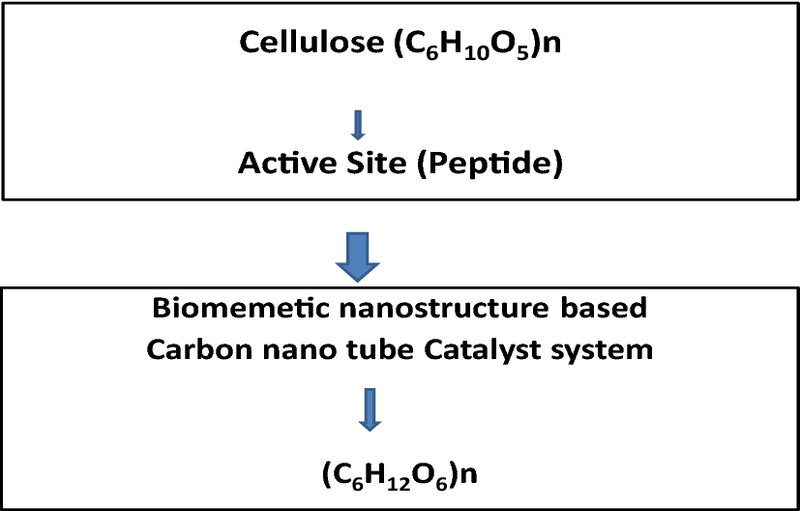 This article discusses and highlights the challenges and future prospects of using biomass as biofuel with carbon based nanomaterials as catalyst (Fig 2). All through the history, wood is being used by the people as a primary source for energy production. The precise values of the sum of the fossil fuel reserves of the world are not been estimated still, as per the International-Energy-Agency there would be a steep rise in oil productions between the year 1996 and 2035 [37, 38]. The prime alternatives of conventional sources are wind, solar energy, water, and biomass. At present the pro-environment nature and plentiful of biomass is attracting the focus shift and it is being predicted that by the year 2050 it would be the 50% stakeholder of demand for energy demand. Biomass includes a wide array of organics as grass, wood, corn-stovers, rice and wheat-straws, agricultural-residue, forest-waste, food-wastes, algae, papers, cardboards and animal-fats etc. Biomass based fuel can play a vital role in decreasing the predicted 60% rise in carbon dioxide emission by the year 2030 [12, 39]. Biomass can be transformed into fuel and energy either by biochemical or by thermo-chemical process. Thermo-chemical route of conversion leads to the production of biofuels like bio-diesel, bio-methanol, bio-hydrogen and bio-oil etc. 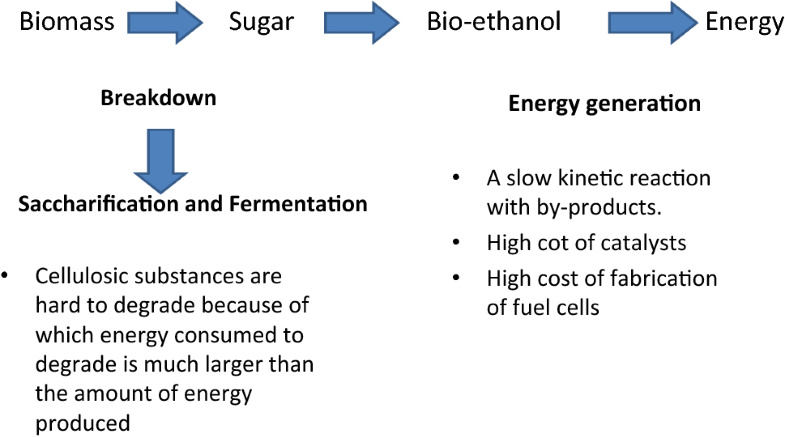 whereas the biochemical route produces gas or liquid fuel through the process of fermentation (Fig 3). Since their discovery by Sir William R. Grove in 1839 [40, 41], electrochemical cells are continuously being used for converting chemical energy into electrical and thermal energy. Fuel cells are no noise electrochemical devices with no charging required, therefore can be an ideal substitute to combustion engines in future devices. Since fuel cells can produce energy with all the components at same temperature (TH = TC = T) they are not restricted by Carnot’s theorem, which says that power cannot be produced when (TH = TC = T). This is because Carnot’s theorem is applicable on thermal engines, which extract work energy from heat energy, while fuel cells extract work energy from chemical energy stored in bonds. Consequently, the conversion efficiency can be improved by using a fuel resource like methanol, ethanol, natural gas and H2 [40, 42]. The problem with the use of these resources is their production, effects on climate, toxicity and safety issues. More than 90% of H2 is being obtained from fossil-fuels and the methanol is also being produced from natural resources [43, 44]. Thus scientists are focusing on safer and greener options like biomass derived bio-fuels which use microbes and bio-enzymes as catalysts . The environment of whole world is getting altered gradually by observing an enormous increase in the percentage of CO2 in the atmosphere resulting from the combustion of fossil fuel. The threat of getting all the fossil fuel reservoirs exhausted is also adding up to this issues. Scientists are extensively exploring new alternatives to fossil fuels through their research on various types of fuel cells, like hydrogen fuel cell, alcohol fuel cells, proton exchange fuel cells, alkaline fuel cells etc. for power generation [7, 46]. Though these substitutes have with improved efficiency, still the issues related to their high working temperature, restricted practicability, corrosive nature of electrolytes and expensive catalyst system are a hurdle to get removed. To conquer these troubles, continuous efforts are being made to explore new routes to convert biomass into energy [11, 47]. To deal with this, microbial fuel cells are potential biotechnological tool which straightforwardly translate the metabolic power of microbes into energy by degrading inorganic and organic substance through biological electrochemical reactions [48, 49, 50]. Energy production using microbial fuel cells is a clean, harmless, effective, and recyclable method which has no toxic by-product [46, 47]. A microbial fuel cell basically is made up of an anode, where organic matter is degraded by microbial biocatalysts and a cathode where energy is being produced by the catalytic-reduction of oxygen [9, 47]. The microbial fuel cells which are generally being used are of two types (i) a single-chamber MFC and (ii) a double-chambered MFC . From the early nineteenth century since the inception of nanotechnology in the energy-sector, it is playing a crucial role in improving the efficiency, catalytic effects and managing the cost of fuel cells, through improvements in their electro-catalytic properties. Various nano-structured substances are being used to augment their rate of energy conversion. The use of nanomaterials in fuel cells improves their thermal-stability and substantially lowers the operating temperature of the cell. Various catalytic methods are extensively being used to produce biofuel from biomass and inclusion of nanocatalysts can improve the product quality and its durability. It’s the large surface area and rich catalytic action of nanoparticles that can help in dealing with the hurdles like inefficiency, fast deactivation-rate, time-consumption and mass-transfer resistance of hetero-geneous catalysis [51, 52]. In sequence of improving the effectiveness of fuel-cells, there is a need of a catalyst and Pt being a noble metal possesses good quality of catalytic-efficiency. The huge cost of platinum is an obstruction in commercialization of Pt based fuel cells. Therefore it is very much necessary to trim down the usage of Pt and design new catalyst systems to improve the redox reaction taking place in the cell. The commonly used catalytic supports include graphene, carbon, and carbon based nanomaterials like carbon nanotubes [53, 54, 55, 56]. A variety of electrodes ranging from single metals to nano-composites, are utilied to improve the performance of biofuel fed cells. The appropriateness of the electrode-material is very much critical for the efficiency of fuel cells. For broader acceptance the electrode material should be cost effective with maximum power density . An appropriate electrode for biofuel based fuel cells should be low in cost, maintenance and high in electrical conductivity, mechanical-strength, reaction rates, and bio-compatibility and possess enhanced catalytic behavior whereas conventional Pt electrodes come with high-cost and suffer with low biocompatibility, sustainability issues, sulfide-poisoning and pH-sensitivity. Numerous features as the electrode-configurations, membranes, materials, catalysts and bio-catalysts effect the biofuel cell performance. Out of all these, the electrode material used affects the cell-performance to the greatest level. In present set-up, metals competent of larger transportation of electrons are being preferred . While noble metal like platinum can perk up the current production, the large scale applications would end up in excruciating expenses. The effectiveness of a bio-fuel cell is primarily determined by the performance of anode used therefore it is very much necessary to focus on its design and the material being used. In an effort to boost up the biofuel cell performance, some modifications are being made through surface modifications and cost effective electrode materials. The collective outcome of these actions resulted in almost 48% increased power generation as compared to the non treated electrodes. The derivatives of carbon as carbon-felt, carbon-fiber, carbon-paper, carbon-glass and carbon-foam are highly being used to improve their performance . The consequences of various anodes on cell performance are tabulated in the Table 2. The selection of cathode-materials significantly influences the cell performance as the oxygen-reduction reaction takes place in cathode chamber only. Electrode-materials employed for anodes can be used for the cathode as well, though it must have high electrical-conductance, efficient catalytic-character and high mechanical-strength. 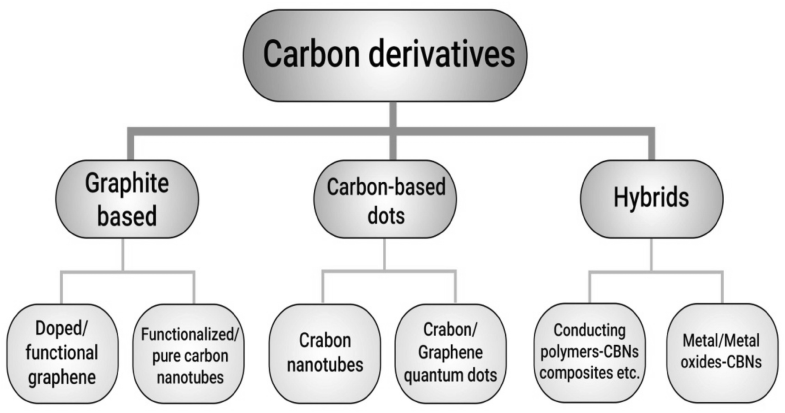 Carbon derivatives can efficiently be used as cathode material owing to their specific properties. The effect of various cathode materials on fuel-cell performance is listed in Table 3. The prerequisites for electrode material might vary with the particular application of microbial fuel cells. In such perspective, carbon derivatives are significantly beneficial because of their wide diverse synthesis methods and peculiar structural and behavioural traits. Their distinctiveness makes them extremely compliant as electrode material (both anode and cathode) in various microbial fuel cell systems . 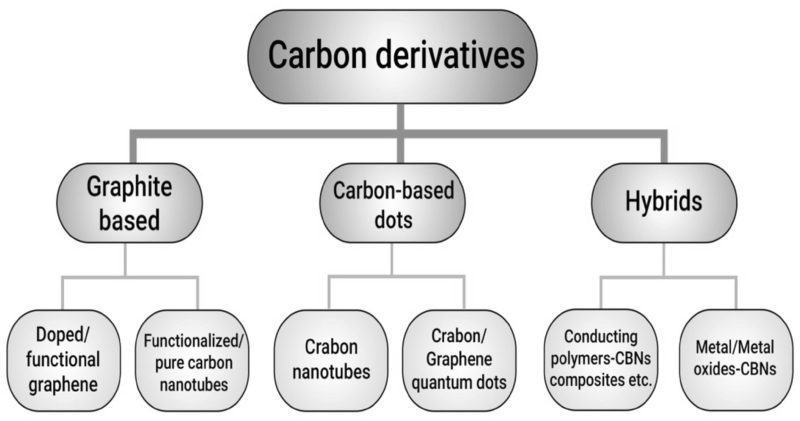 Carbon derivatives have their unique combination of optical, mechanical, electrical and thermal properties which makes them widely being used in drug delivery, biosensors, nanoscale electronics and electron emitting devices etc. The characteristic features of high electronic conductivity with large surface area, nanoscale size, corrosion resistance of carbon derivatives [59, 60, 61, 62, 63] reduces the weight, size and cost of electrodes and makes them important in fuel cell applications, such as the ballistic electronic transport in carbon derivatives [64, 65, 66] enables them to carry a large amount of current without causing heating of the system. Figure 1 shows the carbon nanomaterials significantly being used for fuel cells. A network of carbon derivatives when used in fuel cell positively catalyses the reaction resulting into enhanced energy conversion [67, 68, 69, 70, 71, 72]. Graphene when doped with hetero-atoms has shown high catalytic properties improved characteristics. Cellulose is the most evident source of biomass for biomass based fuel cells because almost 80% of the biomass has cellulose as constituting unit. Cellulose s a water insoluble carbohydrate which does not get dissolve in most of the organic solvents too, therefore it needs to get hydrolysed into a solid substrate first. Sugano et al. successfully produced a cellulose fuel-cell by dissolving cellulose in an alkaline solution using gold anode [73, 74]. To reduce the cost and improve the surface area they used carbon derivatives catalyst system to break sugar substrate just like cellulose . A different approach using microorganisms for the hydrolysis of cellulose molecules in microbial fuel cells is also being adapted by the scientists. Rismani-Yazdi et al. successfully used rumen microbiome for hydrolyzing cellulose olecules and conserving energy through fermentation [75, 76, 77, 78]. The issue of low power-density because of tedious hydrolysis of cellulose and high cost of carbon derivatives is a matter of further research in using carbon based catalyst system in biomass based fuel cells. The easier degradation process of starch makes it a good option to cellulose in biomass based fuel cells. Starch is water soluble at mild heating changing from crystalline to amorphous state. Since starch is the part of most of the edible oils, it is not much explored for fuel cells. Therefore scientists are focusing on utilization of waste water generated from starch processing [3, 79, 80] designed a fuel cell with Pt–Pd anode and 18% 3.15 mg cm−2 CoTPP on carbon and 17.5 mg cm−2 MnCo2O4 cathode. This noble metal catalyst based direct fuel cell using 10gm/L starch in 2 M KOH could gain only 1mAcm−2 at the temperature of 51 °C [81, 82, 83, 84], because of the difficulty in degradation of starch. Though complex to degrade, the better solubility in alkaline solutions improves the power density of starch. The first starch based microbial fuel cell was designed by [52, 85, 86] by using polytetrafluoroaniline coated platinum anode and Clostridium butyricum biocatalyst. It is observed that the surface area of the catalyst could play a key role in improving the performance of fuel cells. Though it can be achieved by using carbon derivatives, very less efforts have been to exploit them in fuel cells using starch as biomass. To facilitate the use of biomass for fuel cells it is necessary to make land available for their cultivation which creates a pressure on food demand and supply equation [87, 88, 89]. For this inedible sea-weeds, marine macro-algae come forwards as a substitute with no demand of land, fertilizer and no effect on food balance. In order to extract energy from algae firstly sugars like glucan and mannitol are being released from their cell wall which is then used as fuel in fuel cells [90, 91, 92, 93, 94]. The studies for using algae generally target on microbial route of converting sugar into ethanol which is being used as fuel in direct fuel cells. The first attempt for microbial degradation of algal sugars was done by using gold anode which resulted into a very meager power density [95, 96, 97, 98, 99]. To enhance the active surface area, gold nanoparticles were drop coated on multi-walled carbon derivatives and this led to a 2.1 times increase in power density [100, 101]. The oxidized byproduct of electrochemical oxidation of algal biomass in carbon nanostructure based fuel cells can be used for tissue engineering, which can pave a new way for concurrent production of feedstock and energy from algal biomass. Biomass based fuel cells are designated as green bio-electro-chemical systems but the selection of electrode materials still remain a challenge for their broad commercial acceptance. However, researchers are adopting numerous techniques to enhance the power efficiency of bio fuel cells through improvements in electrodes. The recent researches focus on exploring various types of electrodes and their nano-modification for more efficient biomass based fuel cells. Nanomaterials are proven to function as potential substrate material in biofuel cells for promoting the electron transfer between the enzyme and the electrode quantitative and qualitative progresses of biofuels. Nanomaterials may well modify the manufacturing of biofuels by making improvements in the digestion of cellulose, enhancing the stability of hydrolysis enzymes and by enhancing the bio-hydrogen production. Further research will help to comprehend the fundamental machinery of alterations made by the nanomaterials. In brief, it can be concluded that this area still is in its primitive stage and quite a few challenges are yet to be conquered. The future research should focus on (i) the cost effective production of nanomaterials (ii) controlling the catalytic properties of nanomaterials, (iii) the interactions between the nanomaterials and microorganism, (iv) and explaining the reaction mechanism at the molecular-level. The positive attributes of biofuels make them an alternative to non renewable fossil fuels. Though, this needs further researches and technological advancements in terms of cost reduction and energy efficiency. Biofuel based fuel cells have a promising future because of their low carbon emissions, non-toxic nature and ample availability of biomass worldwide. However still they have to deal with many challenges before their broad acceptance. Even though the biofuel-based cells can produce energy from biomass, the reported values for current density are still too low, leading to simultaneous extraction of energy along with waste water treatment. Together with the improvements in bond breaking techniques, scientists are working indirect routes of energy extraction from biomass by using bio-ethanol, mono-saccharides and bio-hydrogen. The low power density of these biomass based fuel cells can reach up to the demands of small devices but their durability issues and fabrication cost is still a point of concern. To substitute noble metal-based catalysts, carbon-based nanostructures using carbon derivatives and grapheme, make a 3-D structural design to hold metal microorganism or enzyme to improve active surface area and efficiency or the structure. With the use of carbon derivatives, the power density and circuit potential has increased and natural life of fuel cell was considerably improved. Scientists are working on using catalytic processes based on precious metals like platinum and gold for producing non enzymatic biofuel based fuel cells. In summary, the introduction of new nanomaterials, especially non-noble metal nanomaterials, will be even more important in the design of glucose biofuel cells. In light of these promising signs, further research is needed in optimizing the current density for every type of biomass based fuel cell and discovering and adopting new resources like non noble metal based nanoparticles for long-term and cost effective practical applications on large scale.